TEST - Fujian Shipbuilding Trading Co. Ltd. Being the global shipbuilding marketing arm jointly established by Fujian Southeast Shipyard, Mawei Shipbuilding and Xiamen Shipbuilding, just contact us when you have any enquiry for shipbuilding in China; and we are also in the position for helping secure or directly providing post-delivery seller credit for shipbuilding in China. Our main shipbuilding products are Anchor Handling Supply Tug (AHTS), Platform Supply Vessel (PSV), offshore construction vessel and other offshore support vessels by Mawei Shipbuilding and Southeast Shipyard, while Xiamen Shipbuilding is mainly for the construction for Car Carrier, Bulk Carrier and Container Vessel. The vessel shall be designed and built as twin (fixed pitch rudder propellers), two bow thrusters, and two station controls in wheelhouse. 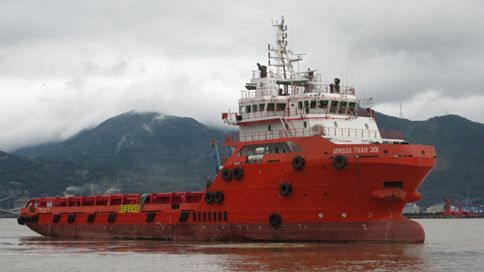 The vessel is suitable to be used as offshore supply and fire fighting Class 1 vessel.